Diets Part IV: Low-Histamine, Mold Diet, Migraine Diet, AIP, Low-Sulfur and SIBO. Well, the uptick in stability I mentioned in my last diet post has gone away. My daily headache is back, my heart rate is back up (not too high, but not the super-low it was), my muscles are worse, my blood pressure is all over the place, and I’m far more exhausted and dizzy than I was in January and February. So, back to normal! When we last spoke, I was on a low-histamine, pretty much paleo diet (allowing rice), plus no eggs, citrus, nightshades or soy. I had a mycotoxin panel done and, in rare abnormal test results, found I had some very high levels in my urine. While researching mold toxicity, I found the “mold-free diet“. I was pleasantly surprised to see it was pretty much the same as the low-histamine diet and I was already following it. I was also dejected to learn there was another reason for me to continue avoiding all of these wonderful foods and bending over backwards to not consume leftovers. Grass-fed, pastured beef sirloin and braised red cabbage from Nom Nom Paleo (click image for recipe). Hmm… Well, yet another reason not to eat dairy, gluten and aged, cured and fermented foods. But I really didn’t want to entertain the idea of life permanently without onions, raspberries, bananas and citrus fruits. Plus, I was still drinking my cup of black tea every morning and eating nuts and some sugar. My three loves. Maybe I would ignore the migraine diet recommendations and just take some Tylenol. Maybe I will revisit this down the road. I decided, since I was almost there anyway, I wanted to give the Autoimmune Paleo diet (AIP) a chance for a month or two and see if it made any difference to anything. My vitilgo is not a big deal, my autoimmune urticaria and angioedema has not been an issue in a few years (knock on wood), but my thyroid is an ever-present problem and ME could have autoimmune roots, so I wanted to give it a try. AIP basically involves no grains, dairy, legumes, nuts, seeds, nightshades, eggs, caffeine, sugar or processed foods. It was designed to be a temporary elimination with reintroductions after the initial strict period, although some people seem to stick with it forever. I mope-ily removed nuts and seeds from my diet last month and was gearing up to kick rice, tea and coconut sugar to the curb when my research into the methylation cycle led me down a side road to a low-sulfur diet. Hold everything. 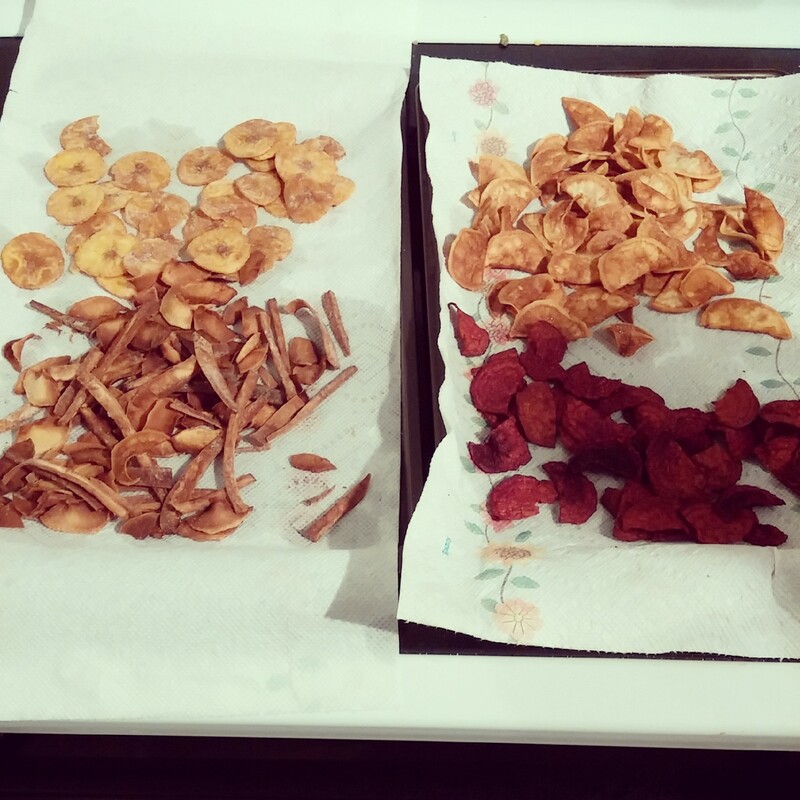 plantain, parsnip, sweet potato and beet chips. My 23andMe results (I’ll go into this in more detail later) showed I have a CBS mutation. Some doctors (most notably Dr. Amy Yasko) maintain that one must deal with this “first priority mutation” before embarking on a protocol to unblock the methylation cycle. The CBS, plus two BHMT mutations, means I may have excess sulfur groups, which deplete molybdenum and BH4 and cause high taurine and high ammonia levels. I know from test results that my ammonia levels are high, so this is something I wanted to address. Working on methylation is a very long process- probably a year or two- so, if dealing with the CBS mutation is the first step, I wanted to get the show on the road. Suggestions are to eat a low-sulfur diet (my research indicated that animal protein was not as much of an issue as high-sulfur/thiol veg), so I omitted garlic, onions, most cruciferous vegetables and leafy greens and I stopped my epsom salt baths. This was hard, but I thought, It’s only for a month or so. While continuing to keep out nightshades and high-histamine foods, my allowed vegetable list was: artichokes, beetroot, carrots, celery, cucumber, lettuce, parsley, parsnips, squashes, and sweet potato. 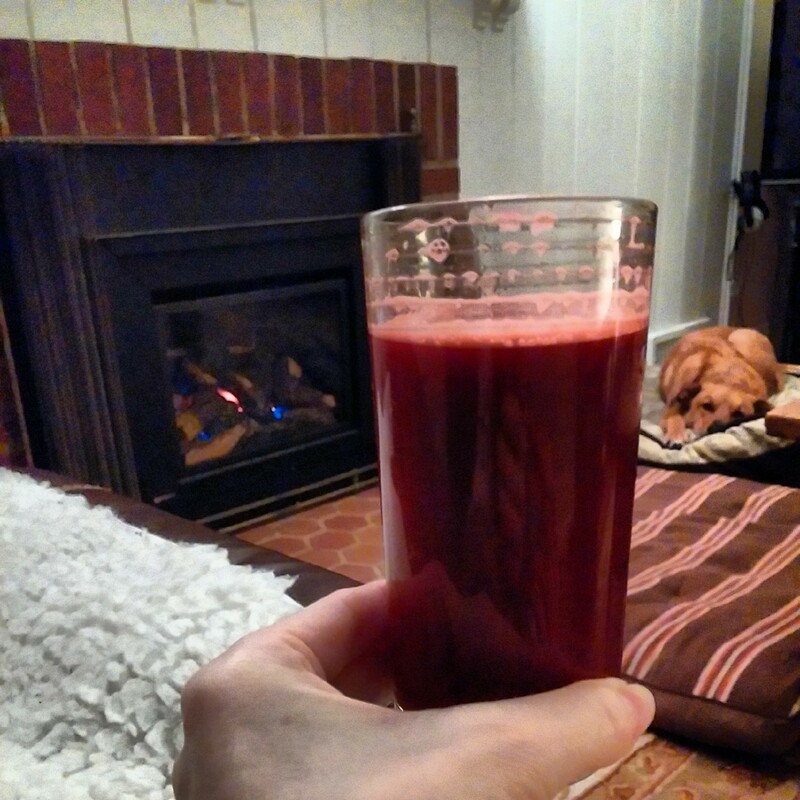 beet, carrot, celery, cucumber, apple, ginger. I started this at the beginning of March … aaaaannndd then I got my appointment with the medical nutrition therapist who was not only recommended by my doctor, but also by someone on one of my Facebook histamine/mast cell groups. Another side road. The appointment was an hour and a half and she went over my symptoms and my food diary (note to self: edit your personal, private food diary before giving it to your doctor so it doesn’t say things like “want to vom”, “fight with D” and “bad poop” 😉 ). She said coconut was very high histamine which threw me for a loop since half my calories come from coconut in one form or another. I debated this fact with her for a while and eventually she said, “You’ll just have to trust me on that.” She also thought I might have a problem with salicylates, which I guess I eat in copious amounts. Joy. And she was concerned about SIBO: small intestinal bacterial overgrowth. As you can imagine, at this stage I really want to dump my diet decisions into someone else’s lap, so, while I still have health insurance that covers her service (for another few months), I am going to trust her and give her plan a fighting chance. I am currently on day two of the SIBO test prep diet. I am only allowed to eat meat and rice for two days (if I’d already eliminated rice, I would only be eating meat, so thank god I procrastinated). Yesterday, I ate turkey, lamb, clear beef broth and rice with butter. Real delicious fatty decadent Kerrygold butter, for the first time in a year and a half. Butter is heaven. But no sweet treat after a meal is hell. I only eat a bit of chocolate or fruit or homemade coconut ice cream, but, judging from my extreme irritability, it is a very real addiction. I’m even salivating at the thought of a lozenge. Having an ever-present sore throat really makes lozenges a necessity! I was secretly hoping that I would feel great these days on such a limited diet and it would spur me on to continue my food elimination experiments. Unfortunately, I am headachy, weak, sore and have zero appetite. Could it be the butter? Maybe, I guess, but I don’t think so. It might be because I washed my hair yesterday. It might just be ME. In the next installment, I will tell you about my ketoacidosis scare and the strict low-histamine + low-salicylate diet that begins next week. I know you are all on the edges of your seats! 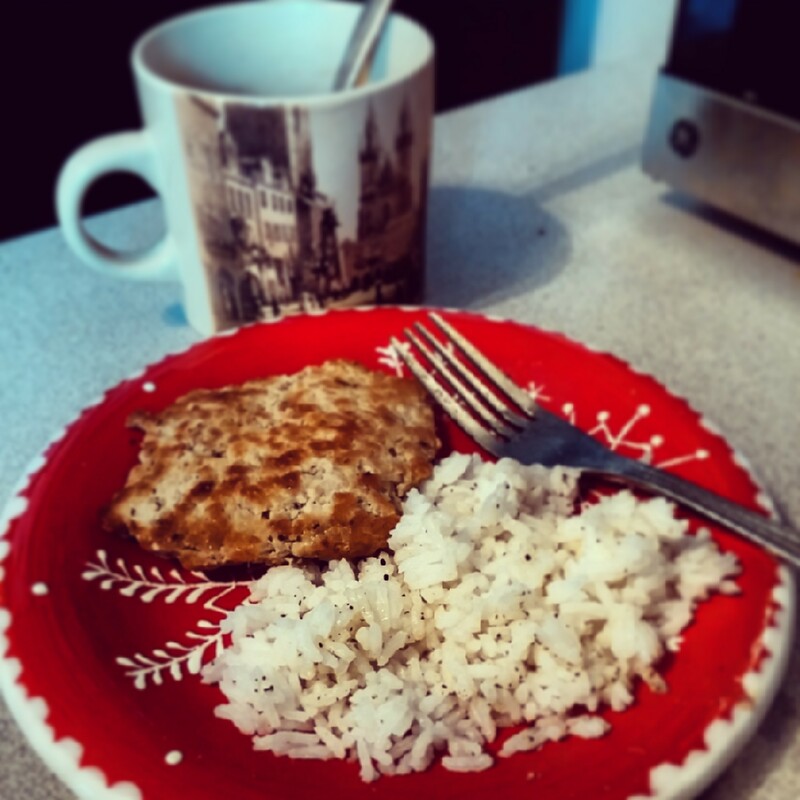 A tip from my Facebook friend, N., to excite my SIBO prep diet: Crispy waffle iron rice!